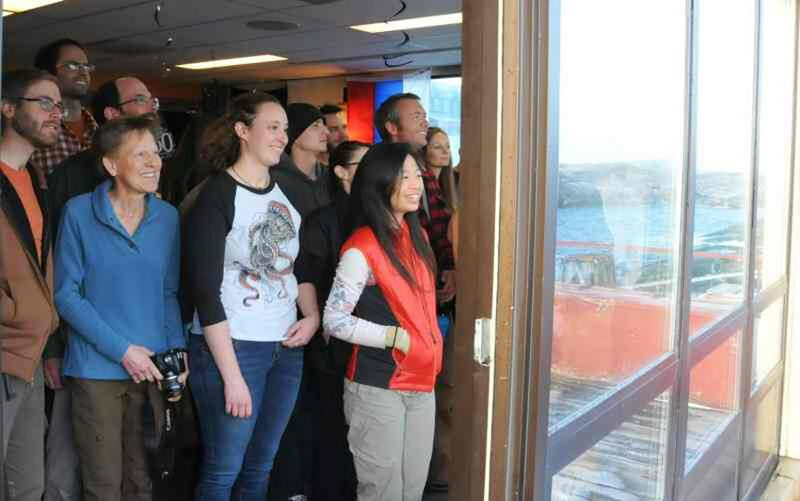 On 20 March 2018 the assembled folks at Palmer Station celebrated the 50th anniversary of the dedication of the Biolab (ZE). The seed for this celebration had been planted by Chuck Amsler the year before. 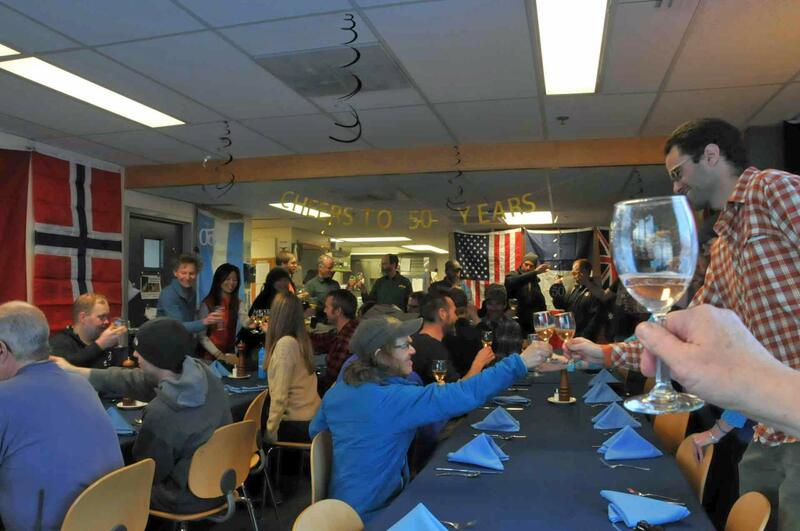 The date marks the 50th anniversary of the Biolab dedication by Rear Admiral J. L. Abbott (NSFA) and NSF representative Philip Smith as described and documented here. Finally, SSL Chuck Amsler made additional remarks about the extensive and different kinds of science that had been done at Palmer Station, including: "That is a phenomenal record of productivity for such a small research outpost. While it certainly speaks to the hard work of the scientists laboring in the labs and on the water, their efforts alone cannot explain it. The exceptional productivity that we in the science groups can have here at Palmer is only possible because we are part of a much greater community comprised of everyone on station. 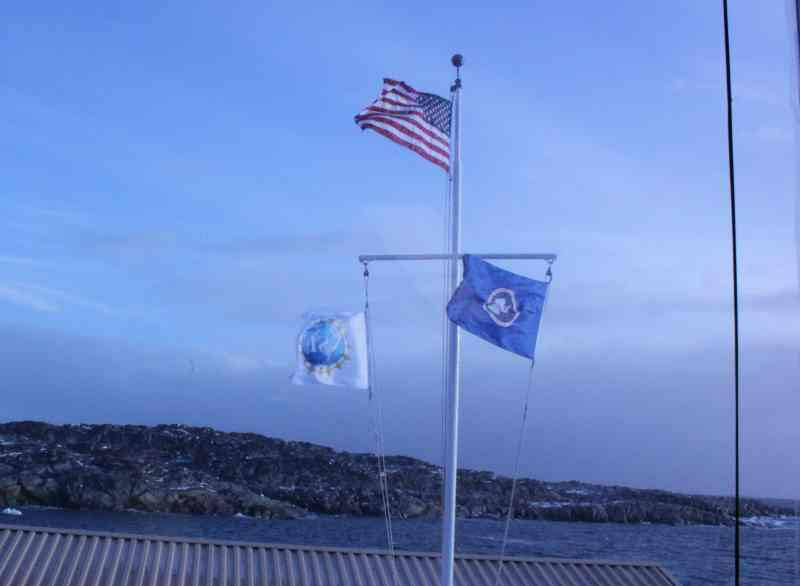 ...followed by the NSF and USAP flags (MA). Most everyone else watched from inside (ZE). She said, in part: "I ask you to raise your glasses. Find a place in your heart to feel the weight of this toast. 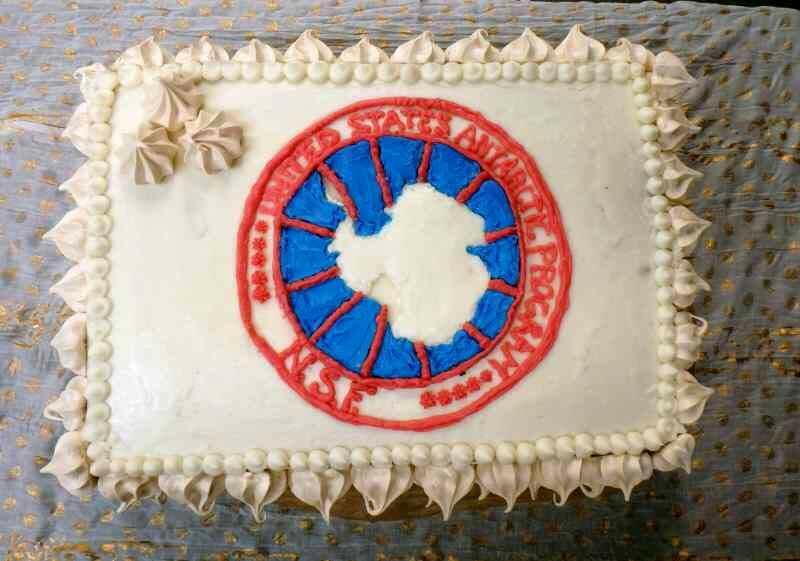 To all of the men and women who work here from all over this earth. 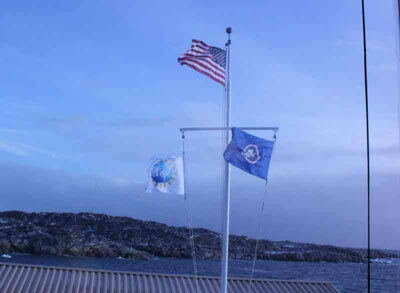 To Palmer Station; to our own nation's dedication to this program; and to this great continent itself. Before dinner, Chuck Amsler conducted a phone call with Jim Turner of Townville, SC--he had been one of the Navy Seabees who helped build Palmer Station in 1966-67 and 1967-68. Jim had been present for the original station dedication ceremony on 20 March 1968, and he spoke about some of his experiences during those deployments. 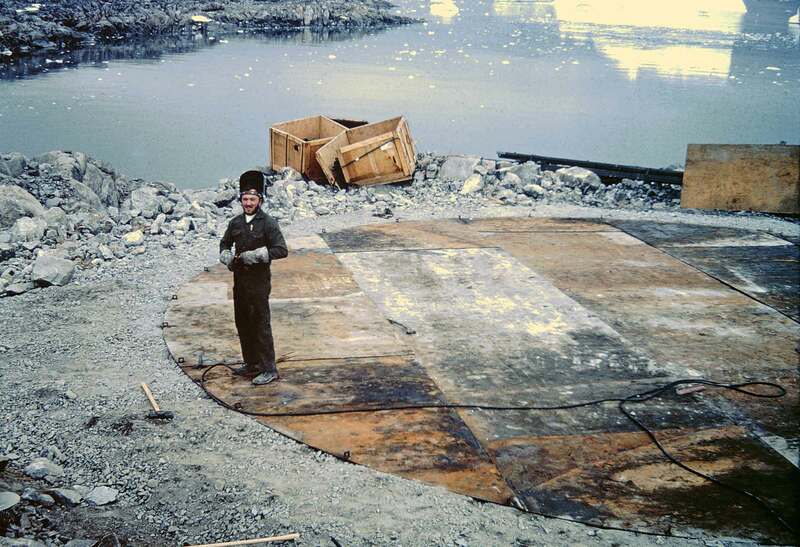 At left, Chuck is conducting the call over the speaker phone; above the phone is a photo provided by Jim showing him standing on the foundation of one of the fuel tanks during its construction in 1966-67. Jim also provided a number of other photos of the original 20 March 1968 dedication ceremony, as well as of the original station construction (coming soon) (photo by KN). 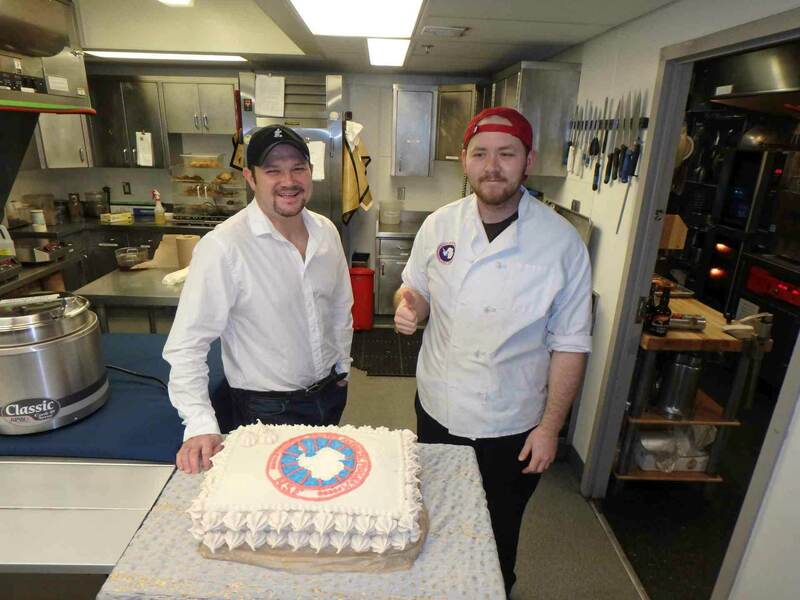 As seen here with food service coordinator Mark Mican (left) and sous chef KC Loosemore (CA). Photo credits and thanks to Chuck Amsler (CA), Maggie Amsler (MA), Zenobia Evans (ZE), and Keri Nelson (KN). 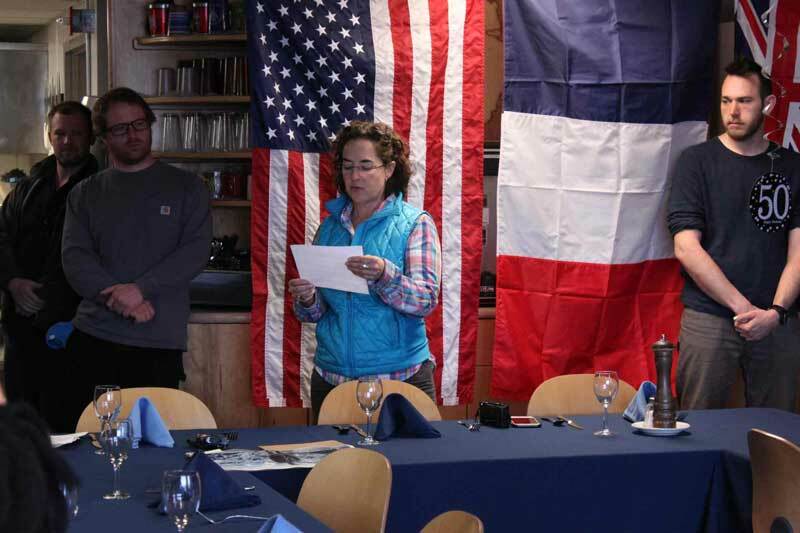 And additional thanks to Chuck for sharing the photos and the text of the speeches. 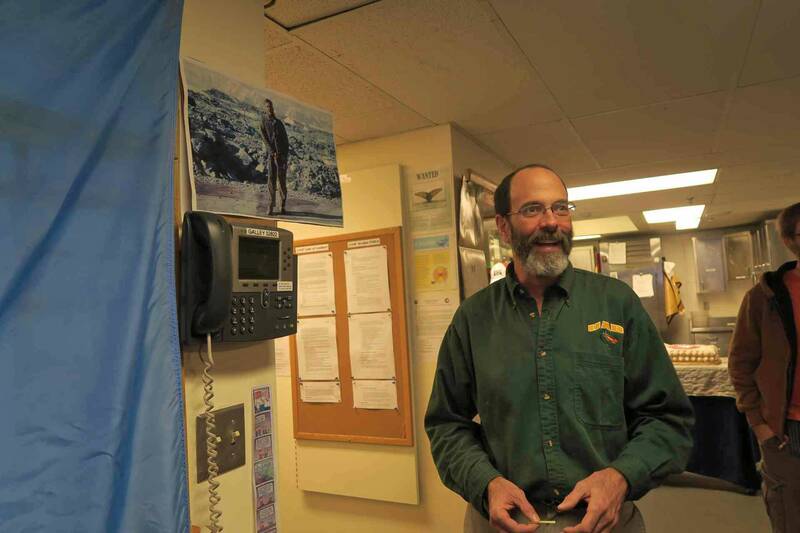 His writeup of the ceremony appears in this blog post from UAB. 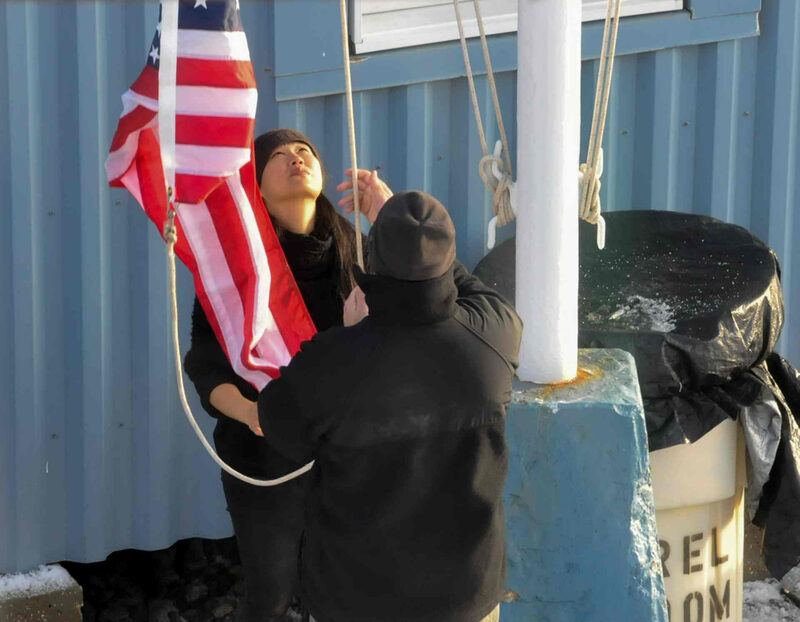 And as long as we're discussing the UAB team, here's another great blog post about Chuck's wife Maggie Amsler and her long history of research at Palmer Station.